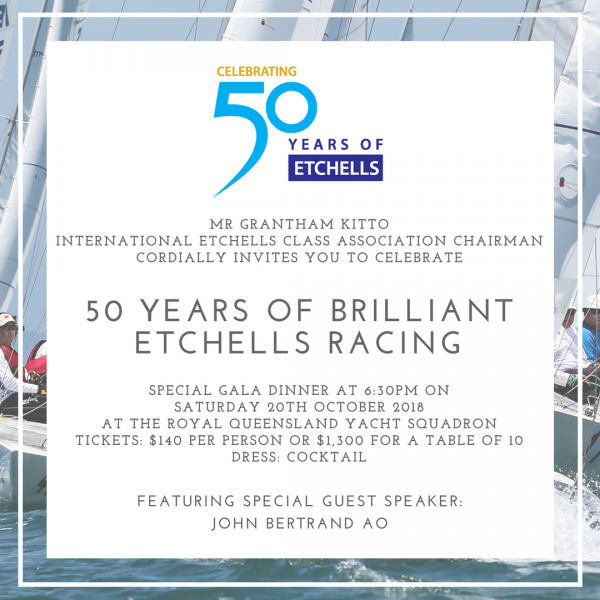 To celebrate the first 50 years of sailing of such a fantastic class, the International Etchells Class Association is inviting all past and present Etchells sailors to a Gala Dinner. This is an international invitation to all Etchells sailors current or past, and Etchells supporters (including Etchells followers, volunteers, long suffering partners) who have competed or been involved in the first 50 years of the Etchells Class. In conjunction with the Etchells World Championships being held in Brisbane, the dinner will be on Saturday night, October 20th here at RQYS. Guest speaker for the night is John Bertrand AO. The Girdis room will be open at 6:30pm for a seated 7pm start. Gentlemen are expected to wear a Jacket & Tie or Lounge Suit and Ladies are to be in cocktail attire. Numbers are limited so be sure to reserve your tickets now! Tickets are $140 per person or $1,300 for a table of 10 people. Book your tickets through this link.